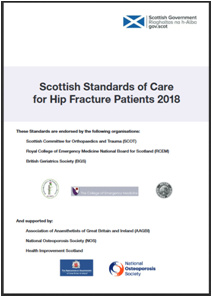 The Clinical Quality Improvement programme for Orthopaedics is aligned to National Standards and improvement in outcome for patients who have a fractured hip. The development of a Clinical Quality Management System will focus on Neck of Femur and may be extended to other orthopaedic specialities and types of fracture in due course. This is an example of clinicians in NHS Lothian driving change to improve outcomes and the quality of care provided to patients. 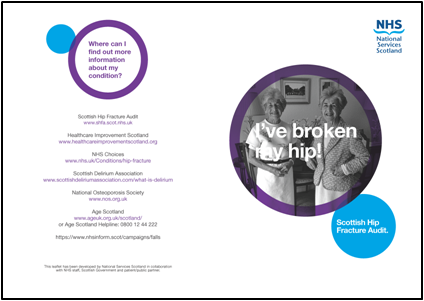 Each year in NHS Lothian we care for over 900 patients with a Hip fracture, it is the most common, serious orthopaedic injury to affect the elderly, with more than 6,000 patients admitted to hospital in Scotland each year. This is likely to increase significantly over the coming decade as a consequence of population demographic changes. It is therefore essential that we manage this injury as effectively and efficiently as possible, primarily for the benefit of patients, but also for the optimum use of NHS resources. 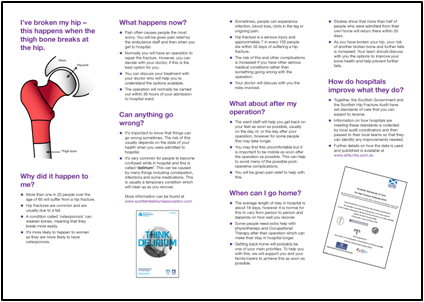 Hip fracture represents an effective ‘tracer’ condition as the management of this injury often requires a complex journey of clinical and social care involving many different disciplinary teams and community based services. 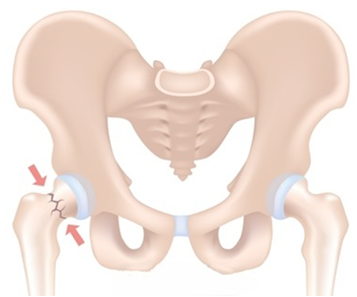 As such, if we improve the quality of care for hip fracture patients, then we can expect to improve the care provided to other fragility fracture patients.